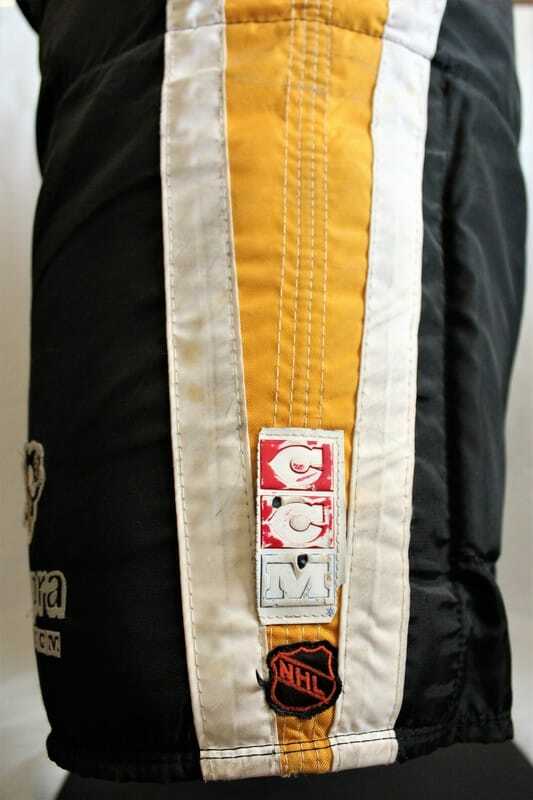 worn as lemieux raised the stanley cup in chicago stadium on june 1, 1992 capturing the second of back-to-back stanley cups. 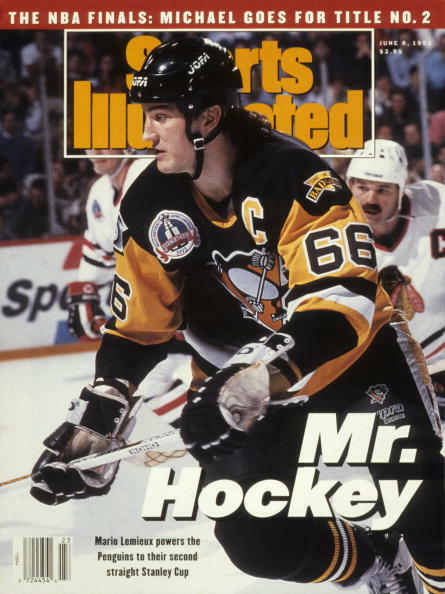 Mario Lemieux won his third Art Ross Trophy as the National Hockey League's leading scorer in 1991-92 amassing 44 goals and 67 assists for 131 points in 64 games. 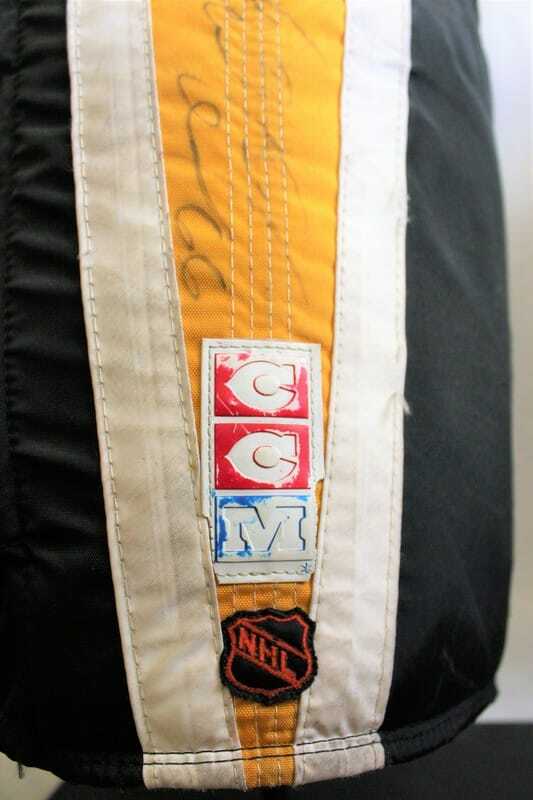 He was also voted to the NHL All-Star Second Team. 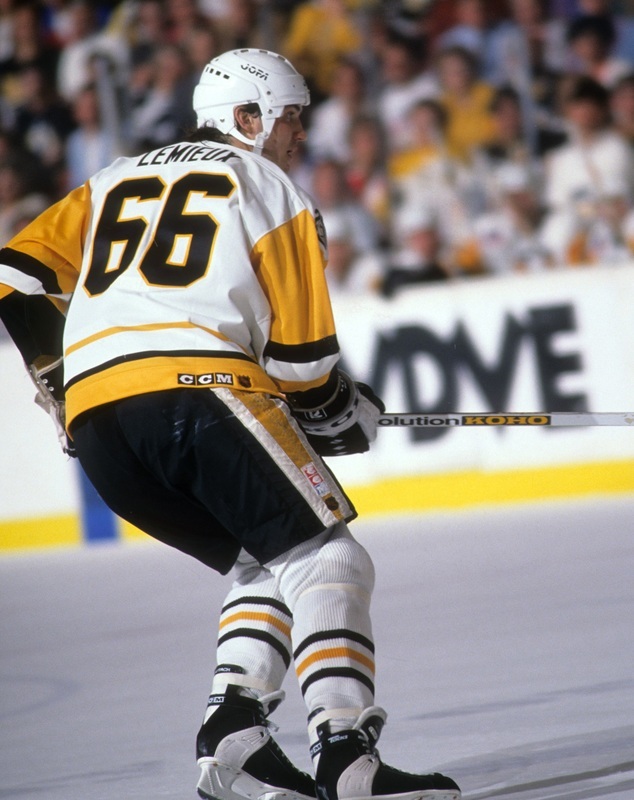 Lemieux led the Penguins to a third place finish in the Patrick Division and a first round match-up with the Washington Capitals. 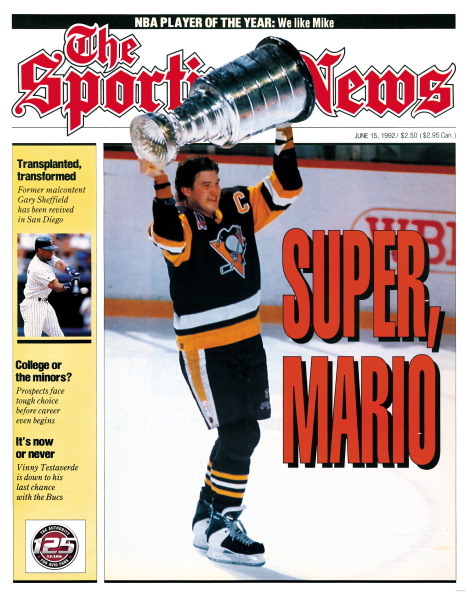 After defeating the Capitals in six games, Pittsburgh met the New York Rangers in the Patrick Division Finals. 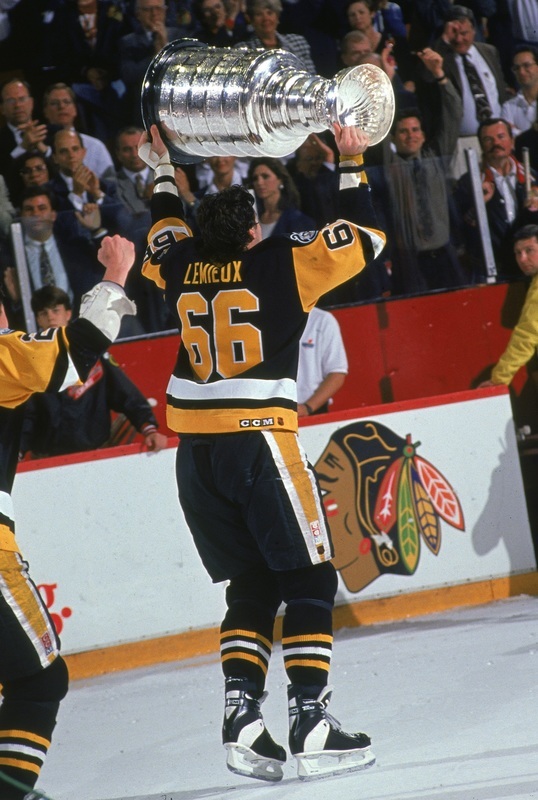 After winning Game 1 at Madison Square Garden, the Penguins scored 1:29 into the first period of Game 2 seizing momentum until Adam Graves viciously slashed Lemieux 3:06 later, breaking Lemieux's left hand. The Penguins lost Games 2 & 3 before winning three straight to advance to their second consecutive Wales Conference Final. 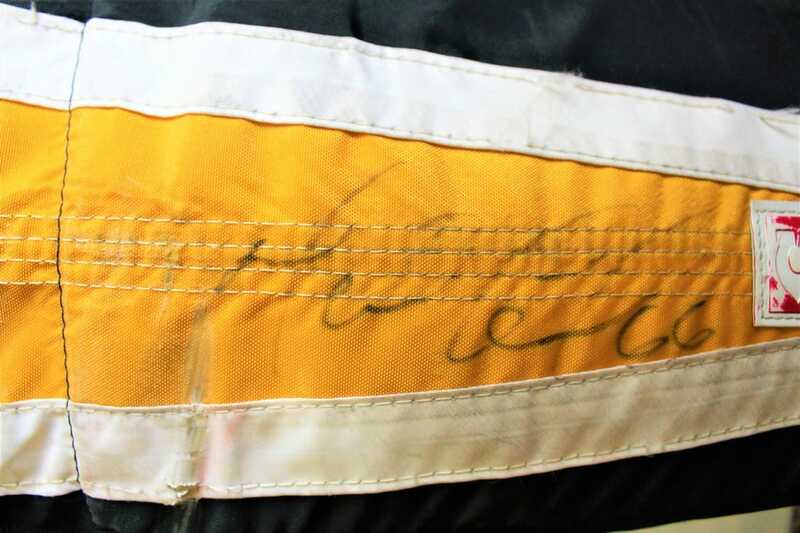 Lemieux returned in Game 2 against Boston, just two weeks after breaking his hand, and scored two goals and assisted on another as the Penguins went on to sweep the Bruins and advance to the Stanley Cup Final against Chicago. 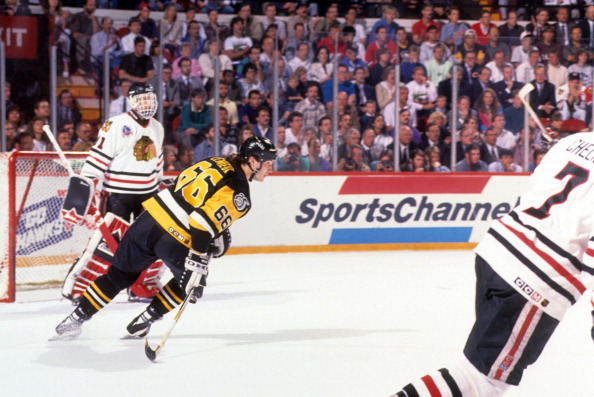 In Game 1, the Blackhawks stormed out to a 4-1 lead with 8:24 left in the second period. 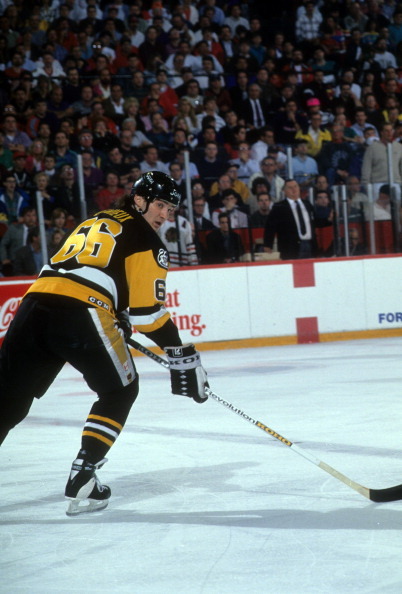 Rick Tocchet scored with 4:36 left in the second to cut the lead to 4-2 before Lemieux banked a shot off of Chicago goaltender Ed Belfour from behind the net 59 seconds later to make it 4-3. 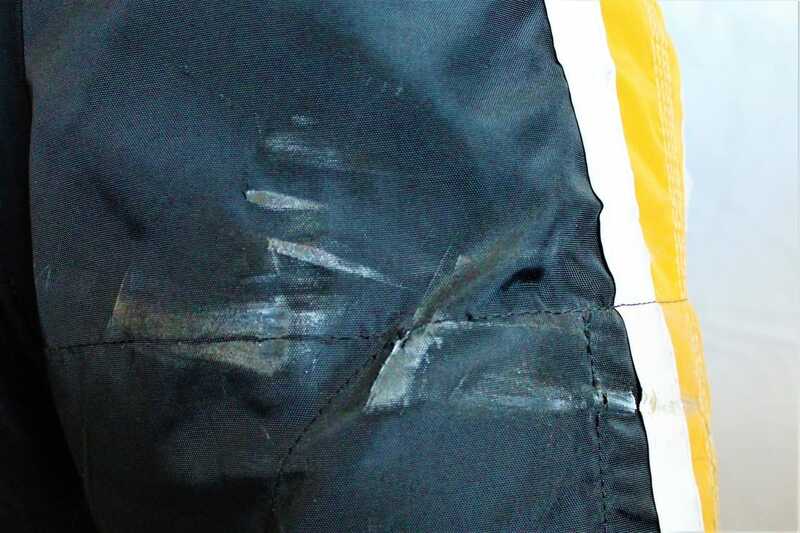 Jaromir Jagr's dazzling goal with 4:55 left in the game knotted the score at 4-4. 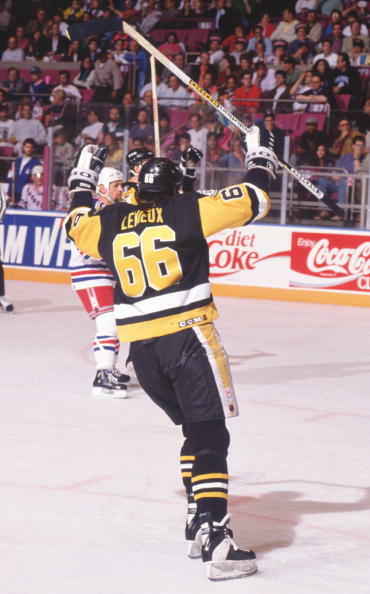 Then Lemieux took over. 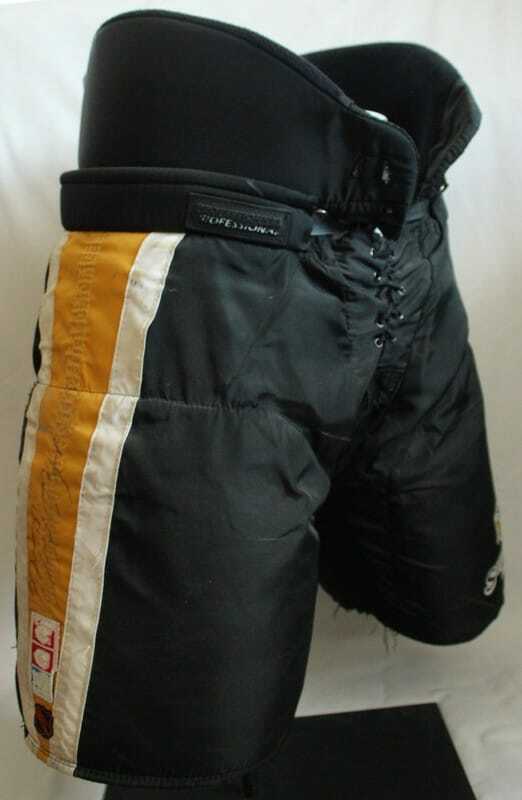 This pair of pants was worn by Mario Lemieux throughout the 1991-92 NHL season including on March 14, 1992 as he scored his 400th NHL goal at Maple Leaf Gardens in Toronto and on March 24, 1992 as he scored his 1,000th NHL point at Joe Louis Arena in Detroit. 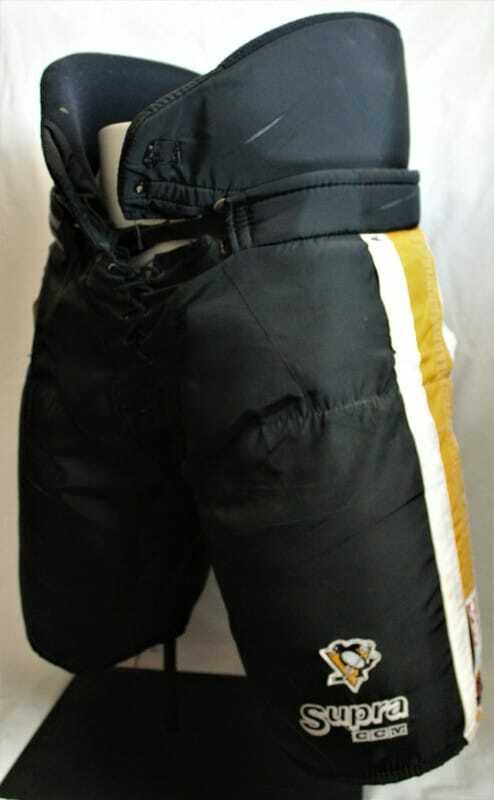 He also wore these pants during the 1992 Stanley Cup Playoffs and Stanley Cup Final. 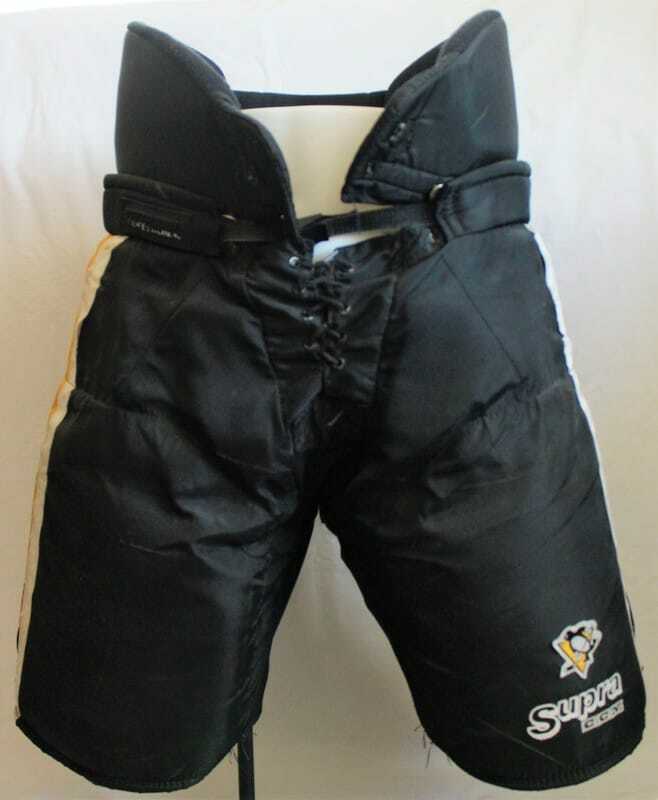 Mario Lemieux was wearing this pair of pants on June 1, 1992 as he accepted the Stanley Cup from NHL Commissioner John Ziegler at Chicago Stadium in Chicago, Illinois after Game 4 of the 1992 Stanley Cup Final as the Penguins defeated the Chicago Blackhawks, 6-5, to complete a sweep of the series. 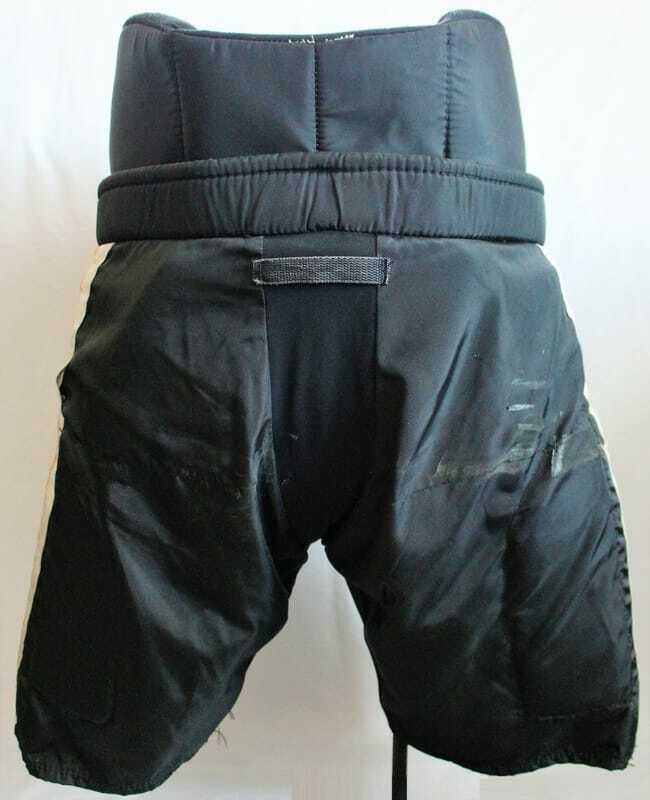 The pants were acquired by PenguinsChronicles.com from a private collector in 2006 who originally purchased the pants from a private source in 2006.